The Crown-of-Thorns Starfish - or COTS - is a familiar sight for scuba divers in tropical waters: the starfish, resembling the biblical that gave it its name, swarms over coral reefs around the world in huge spawning and destructive events. In the modern era, COTS were first reported in 1957 from the very shores in front of OIST, in the village of Onna-son, Okinawa where it is locally known as “onihitode” - the “Demon Starfish”. Subsequently COTS were observed most dramatically on the Great Barrier Reef where they started aggregating in colonies up to several million individuals, devouring reefs completely and becoming a major ecological concern. Left: A Crown-of-Thorns Starfish (COTS). Right: another COTS feeding on a coral reef, resulting in bleached coral seen on the foreground. New research, published in Nature, brings a trove of new information to potentially control the invasive species. A collaboration of OIST and Australian scientists sequenced the entire COTS genome for the first time, revealing the starfishes from the Great Barrier Reef and Okinawa share identical genetic material. “Although the samples were taken from individuals found 5000kms apart, on different sides of the equator, we confirmed they belong to the same species” commented Prof. Satoh, author of the study. Second, they identified water-borne molecules COTS use to communicate – like an underwater sense of smell - to regroup in large destructive populations. While typical genome projects focus on the DNA from a single individual, one strength of this study is a very robust model of the COTS genetic blueprint thanks to the collation of the genetic material from two individuals decoded independently. The researchers collected one specimen on the Great Barrier Reef, the other from a reef in Motobu on the western coast of Okinawa. Both genomes were sequenced by the DNA Sequencing Facility at OIST; the sequences were then assembled into genomes and analyzed by OIST graduate student Kenneth Baughman and his colleagues in the Marine Genomics Unit led by Prof. Satoh. On the other side of the equator, Australian researchers at the University of Queensland bioinformatically analyzed the COTS genomes. 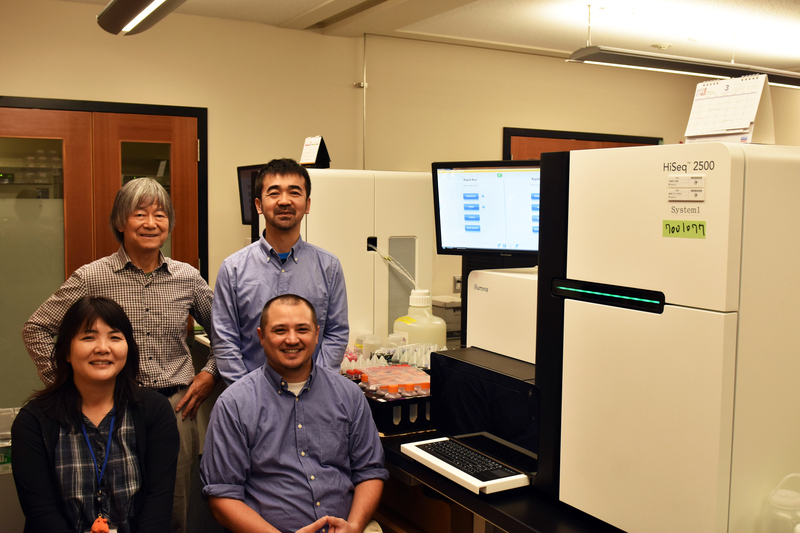 Members of the OIST Marine Genomics Unit next to the next-generation DNA sequencing device used in this study. Standing, from left: Prof. Noriyuki Satoh and Dr. Eiichi Shoguchi. Sitting, from left: Kanako Hisata and Ken Baughman. However, a genome by itself is like a kit for a piece of furniture without the instruction manual – you have all the pieces, you just do not know what they do individually, how they fit with each other and in which order to assemble them. Scientists would have a hard time solving the role of each gene without clues, particularly those specific to COTS. Therefore, they resorted to a different strategy to identify genes that could be used in COTS biocontrol. Based on observation of COTS behavior during spawning events, researchers hoped to identify chemical signals COTS are known to release in the water to communicate with other COTS close by. To do so, researchers at University of the Sunshine Coast and the Australian Institute of Marine Science built a Y-shaped aquatic maze, with a starfish starting at the end of the longest branch. In one experiment, they fed one of shorter branches with water collected from an aggregation of COTS. Because the starfish moved towards this branch of the maze as compared to control water samples, they concluded that those water samples must have contained molecules that induced the starfish to gather with other members of its species. The same water samples were then analyzed biochemically to identify these molecules, which were then mapped to the COTS genomic data. Because the scientists are now in possession of the full genome, they could confirm that these molecules originated from COTS. You can find the University of Queensland press release about this story - with an interview of Australian scientists - here and the report from the Australian Institute of Marine Science there.